Information regarding the SmallCap Value Composite is historical and does not represent the history of the SmallCap Value Fund. The inception date of the SmallCap Value Fund is May 1, 2012 and while the Composite and Fund are managed in a similar manner they are separate products. Why do you believe that active management can beat indexing in the small cap space? Financials have been a part of your portfolio consistently over the years and have recently contributed to your results. How do you view financial stocks at different points in the cycle? While you are primarily a stock picker, you have a macroeconomic overlay that drives some of your stock selection. Can you describe it? What is your outlook for small value stocks? A number of your stocks pay dividends. Do you look for dividend payers when selecting companies? The most important reason is that there are significant inefficiencies in the small cap space which create more opportunities for proprietary fundamental research to add value. Fewer Wall Street analysts follow these companies. The probability that small companies will produce results that are significantly better than consensus expectations is high. Unlike big companies that have sales and revenue that are far more predictable, smaller companies work off of a smaller base with far more variable revenues and profits. There are more catalysts for surprises and those surprises actually have an impact. Small changes in a product line don’t move the needle at P&G, but can have a real impact at a small company. With an economy that has come full circle, the environment has stabilized and begun to improve, led by housing, with inflation remaining under control. 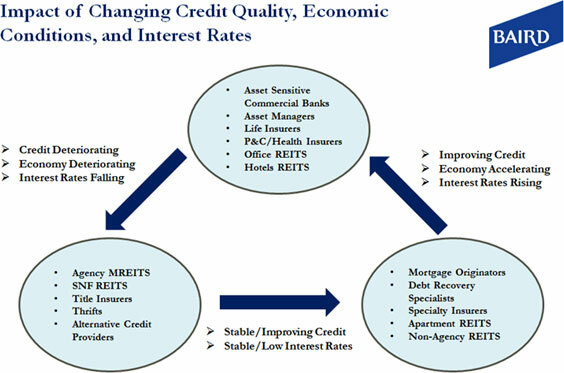 While we don’t expect robust growth, we are buying some companies with economic sensitivity and leverage to rising rates including some commercial banks, debt recovery specialists, and insurers including Portfolio Recovery Associates (PRAA), Bank of Interet (BOFI), and AmTrust Financial (AFSI). Our financials exposure today at over 40% exceeds the index weight of 38%. While you are primarily a stock picker, you have a macroeconomic overlay that dirves some of your stock selection. Can you describe it? The types of companies we like in this environment include value proposition retailers, low-price consumable brands and rent-to-own. We like companies such as Rent-a-Center, Inc. (RCII), Jarden Corp (JAH), Dollar Tree Inc. (DLTR), and Hanesbrands (HBI). We also continue to invest in infrastructure plays that are leveraged to growing energy demand, including pipelines for domestic shale plays such as MasTec (MTZ) and companies that benefit from power distribution upgrades such as Valmont Industries (VMI). We like the commercial aircraft industry, such as component manufacturer Hexcel (HXL). And we continue to invest in the secular trend toward the growth in online services such as internet-based banking and retail, domain registries, online bill play, cloud services and digital media. 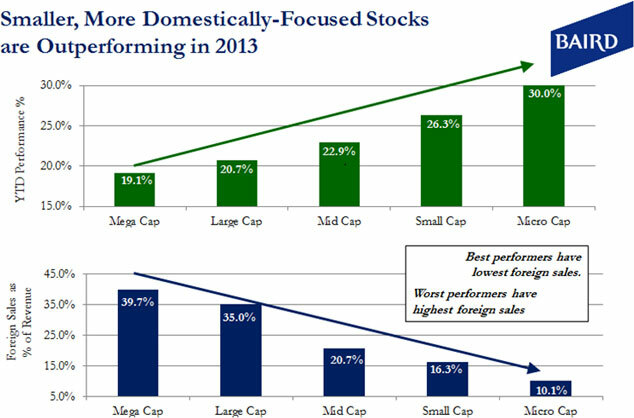 This year, small stocks have outperformed, especially those whose primary business is domestic. In periods of economic recovery, small caps tend to do better and are more leveraged to economic growth. We look at PEG Ratios (P/E/annual growth rate) as a measure of stocks’ value relative to its growth. Consider the forward revenue growth rates, P/E ratios and PEG ratios for various indices. Historically, small caps have had better revenue growth than large caps and we think the market will pay for growth. Our portfolio yield is usually in the ballpark of the benchmark, and most of the yield is concentrated in our REIT or utility holdings. Most of our stocks do not pay dividends however. We look for companies with good organic growth prospects who will use their cash to invest in their own growth versus paying out cash to shareholders in the form of a dividend. In our view, if a company can re-invest in their business and earn 15-20%, we’d prefer that to a dividend. 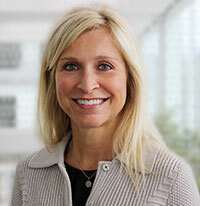 Michelle Stevens is Senior Portfolio manager and has more than 18 years of investment industry experience, having managed mutual funds, sub-advised funds and institutional separate accounts in the Small-, Small-/Mid- (SMID) and All-Cap Value Equity disciplines. Stevens is the manager of the Baird Small Cap Value Fund (BSVIX, BSVSX). She holds an MBA from the University of Cincinnati and received her bachelor’s degree in economics from Wittenberg University. She also holds the Chartered Financial Analyst designation. Baird is an employee-owned, international wealth management, capital markets, private equity and asset management firm with offices in the United States, Europe and Asia. Established in 1919, Baird has approximately 2,800 associates serving the needs of individual, corporate, institutional and municipal clients. Baird had more than $100 billion in client assets on March 31, 2013. Committed to being a great place to work, Baird ranked No. 14 on FORTUNE’s 100 Best Companies to Work For in 2013 – its tenth consecutive year on the list. Baird’s principal operating subsidiaries are Robert W. Baird & Co. in the United States and Robert W. Baird Group Ltd. in Europe. Baird also has an operating subsidiary in Asia supporting Baird’s investment banking and private equity operations. For more information, please visit Baird’s Web site at www.rwbaird.com. Performance data quoted represents past performance. Past performance does not guarantee future results. This is not a complete analysis of every material fact regarding any company, industry or security. The opinions expressed here reflect our judgment at this date and are subject to change. For additional information on the securities mentioned contact us at 1-800-792-4011. Please click here for information concerning the Small Cap Value Composite holdings. Small cap stocks may be subject to a higher degree of risk than more established companies’ securities. Securities of small and mid-size companies may be more volatile, less liquid and face greater risks and price fluctuations than larger, more established companies. The Russell 2000 Value Index measures the performance of the Russell 2000 companies with lower price-to-book ratios and lower forecast growth values. Indices are unmanaged and are not available for direct investment.